Which candidate should be US president in 2012? ProCon.org has researched the US presidential candidates and their views on 75 issues including abortion, bailouts, education, medical marijuana, and taxes. 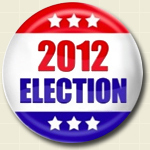 Read our simple, nonpartisan, pro-con presentations and decide for yourself: "Which candidate should be US president in 2012?" ARCHIVED WEBSITE: No new data posted since Jan. 22, 2013. The 2012 Election website received 1,786,030 sessions between Oct. 24, 2011, when the site first launched, through Election Day on Nov. 6, 2012. We kept it active until Jan. 22, 2013, the day after Barack Obama was inaugurated for his second term as President of the United States. The site is now archived - meaning we will no longer make any updates to it. The site will remain accessible on the homepage of ProCon.org. Thanks to all our readers, staff, and volunteers who made the project such a success. 69. Lower taxes = more jobs?